TORONTO (Dec. 5) — I start today by posing a question that dovetails with the recent chatter about restricted free agency in the National Hockey League: Other than Connor McDavid, is there a player that deserves a more–lucrative contract than Auston Matthews? It’s a subjective and open–ended query; one that emanates from the frequency in which I observe the top draft selection of 2016. But, the more I watch this young man, the more I’m convinced he stands alongside McDavid as the best hockey player in the world. Fans of the Winnipeg Jets may quibble, with justification, that Patrik Laine is the nearest facsimile to McDavid — an argument difficult to counter. Pittsburgh hockey fans might suggest that Sidney Crosby, for more than a decade now, has been commensurate to McDavid in every way… with three Stanley Cup rings as undeniable proof. Again, how to counter? Denver hockey followers likely contend that Mikko Rantanen (currently leading the NHL with 46 points) is comparable to McDavid, Matthews and Laine. As mentioned, any–such viewpoint is largely subjective. Being someone, however, that has closely watched the Toronto hockey scene as a fan, reporter and blogger since 1966, I can genuinely say that Matthews is the most–gifted and dynamic skater the Maple Leafs have deployed over the past half–century. It doesn’t necessarily equate to Matthews being the “best” or “most–complete” player during that time; no Leaf has ever performed more thoroughly and spectacularly over a two–season span than Doug Gilmour from 1992–94. Followed closely, in my years, by Darryl Sittler (1975–78). Neither can I obviously comment on such–franchise legends as Charlie Conacher, Syl Apps, Ted Kennedy, Gord Drillon, Max Bentley… or even Dave Keon in his early–1960’s prime. I didn’t see the first five and I remember Keon toward the end of his Maple Leaf days in the early–70’s. Matthews, however, is a different breed. Among Leaf players that could unilaterally alter the course of a game, only Gilmour and Borje Salming rank in the same category. And, only Lanny McDonald possessed as quick and deceptive a shot (just ahead of Rick Vaive, Phil Kessel and Wendel Clark; the latter’s overpowering). But, none of the aforementioned played on a Toronto team with as many front–line NHL forwards. That Matthews can dictate the outcome of a game while routinely rising beyond Mitch Marner, John Tavares, William Nylander, Nazem Kadri and Patrick Marleau provides him the edge as the most–compelling Leafs skater I’ve ever seen. My only concern regarding Matthews is durability. There isn’t yet enough evidence to suggest he cannot string together years of healthy service. But, neither do we know if he’s the proverbial “china doll” — size and ability notwithstanding, his body unable to endure the rigors of the NHL schedule. That Auston has missed 34 of the past 94 regular–season games (dating to Nov. 8, 2017) provides rationale to at least wonder. 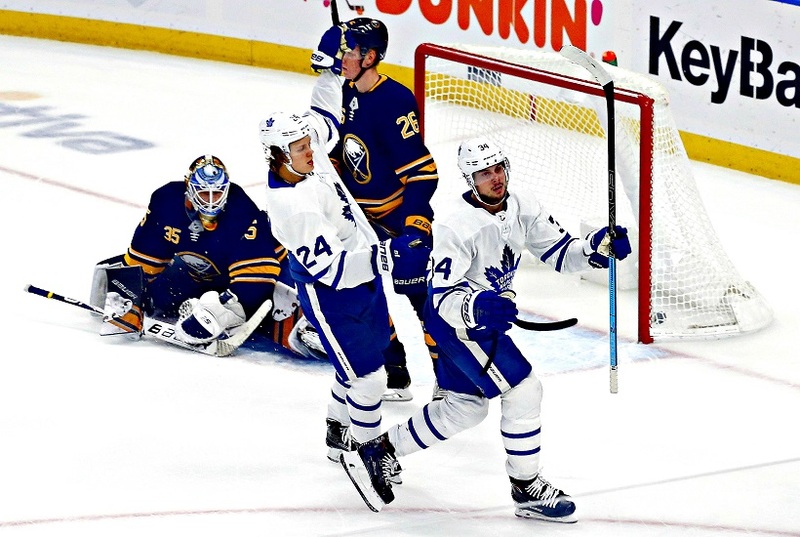 Yet, how often, here in Toronto, have we seen players that can score the caliber of goals that Matthews inflicted on the Buffalo Sabres Tuesday night? Controlling the puck from mid–air with a gloved hand while moving speedily around the net and stuffing in a backhanded–wrap? Then, pulling in the puck with the tip of his blade and firing — in the same motion — a dart into the top–corner of the net (to win the match at First Niagara Place with less than three seconds remaining in overtime)? These were goals that maybe a half–dozen players in the world can score… and no one else, that I’ve ever seen, wearing a Maple Leafs uniform. Without question — and barring only another long injury–absence — Matthews’ remarkable gifts will be reflected, prior to next season, in his first contract beyond entry–level salary restriction. As it stands, I see no justification for Bobby Orr (Auston’s agent) to not request the $14 million in salary McDavid will average in the next three seasons and the accompanying $12.5 million cap–hit. Which, as we know, will only complicate the cap–crunch that Kyle Dubas must navigate after signing Nylander to a six–year pact with nearly a $7 million annual burden. Marner, threatening to become the first 100–point Maple Leafs winger, will also likely weigh in with a demand for double figures in salary and cap–commitment. All we know, for certain, is that Matthews will be the face of the Toronto franchise — contractually and else-wise — over the coming decade. A distinction he warrants with virtually every Leafs appearance. With the Coyotees, “Cap Space” does not matter. They are broke and can’t afford to actuually pay the cap floor. No team will offersheet Matthews or Narner. There hasn’t been an offersheet to any NHL player in 5 years and it was a disaster (O’Reilly by the Flames). Pension Plan Puppets did a great breakdown on this. I sincerely doubt Matthews will ask and get 14.5 million. And Marner on’t get above 10 million (Howard has been on record saying he’ll get 12-12.5 million. The media likes offersheet talk because it drives ratings and clicks on the internet,. My concern is that he may pull a “Tavares” and take a hometown discount to bring hockey frenzy to the Coyotes. IQ. He’s an amazing talent and should be the Leafs Captain already is there any reason he hasn’t been given the C ‘ yet? Leafs fans can only hope he attains and surpasses while bringing the coveted Stanley Cup back to Toronto soon! Go Leafs Go!